A painting that was found behind an old bureau could sell for a six figure sum when it goes to auction. The painting, which was covered in dust and cobwebs, was found during a house clearance in rural Northamptonshire. It is believed to be the work of French 20th century post-impressionist Maurice Utrillo. Utrillo was spurned by the art world during his time but his works have since gone on to hold the kind of esteem usually reserved for others in his field such as Monet and Renoir. 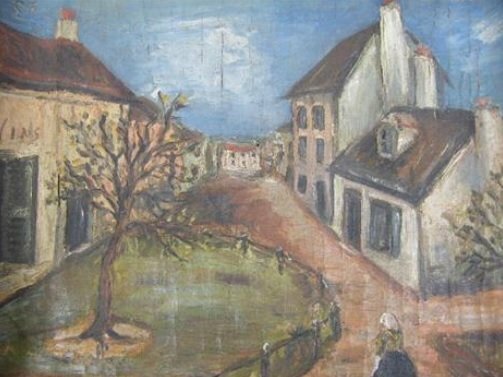 Despite the fact that the signature is missing, experts firmly believe it to be one of his pieces as the image is of a French town and the brush strokes are indicative of Utrillo’s style. Previous works of his have fetched millions, including one in December which sold for £4.3 million at a Parisian auction. He want on to say that the signature had probably been scratched out to make it easier to get the painting out of France.